Note: It’s our last night in Riga. 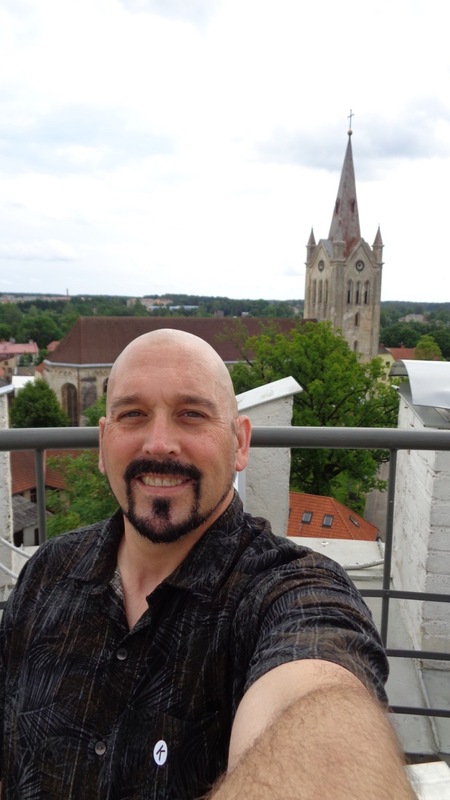 I should be packing and sleeping because we are leaving at 4:30 a.m. for the airport, but instead, I need to write this blog because I know that once I leave Latvia, the memories will fade. Smiltene was the highlight of the trip. The jewel of our adventures. The one that Vitauts will remember. This is a hard entry to write because it could be a novel in and of itself, but time and attention spans are limited, so I’ll do my best to keep it concise and focused. Composition 101! We started Wednesday morning at 9 a.m. to pick up Gita at her apartment way out in Southeast Riga. 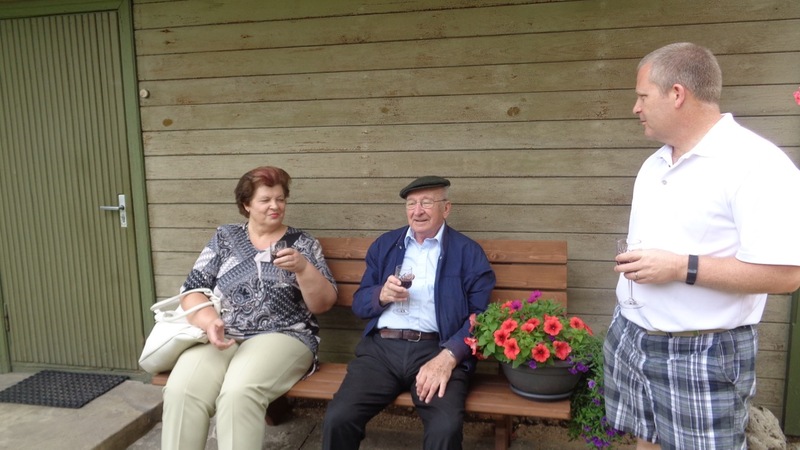 The plan was to drive with her to Cesis where we would meet some of our Grinvalds relatives, and then go to Smiltene to see dad’s old farm and to meet Helma, his childhood friend. We didn’t really know exactly how it was all going to work, but one think you learn about Latvia is just go with it. Roll with it. Everything will be fine (except the smoked mackerel from Remi… it is not and never will be fine). Gita was excited to see us, and she helped dad pick out some flowers and a bottle of wine to take as gifts for Helma. Then we started our adventure on the Latvian highway. The roads in and around Riga are fine, but once you get out of the city, watch out. Every kilometer is an adventure waiting to happen. Either a crazy driver wants to pass you on a turn with oncoming cars, or you hit a bump so deep that the van seems to float in the air for a moment before crashing back down. I had driven this road before in 2005, but I remembered it as having been a pretty nice highway. I think that the road repair crews have a lot of work to do, especially in winter when it freezes. Me, Janis, Gita, Janis and Austra in 2005.
famous for it’s castle until Gita told us about it, and then we drove by it on our way to my cousin Janis’ home. 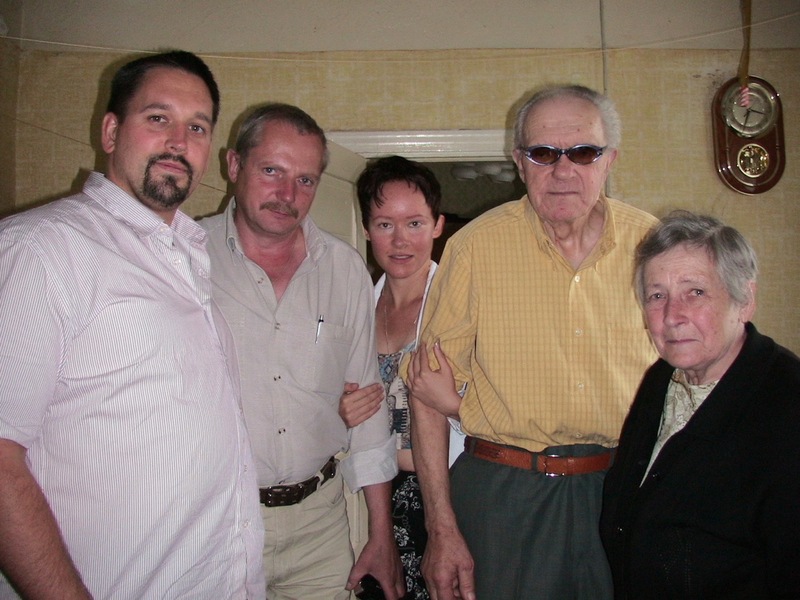 We met Janis, his sister and Gita’s mother Mara, Gita’s half-brother Juris and followed them. They were all driving Audis, so that was kind of cool. 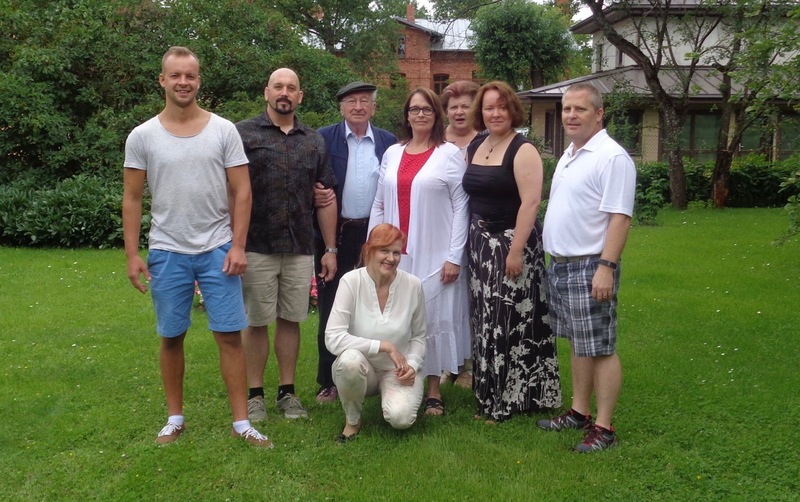 All of these family members are Austra’s children, and Austra was Vitauts sister whom I met in 2005. She died in 2011. Mara and Vitauts on Jani’s bench. Janis had a picnic all set up for us in his backyard. 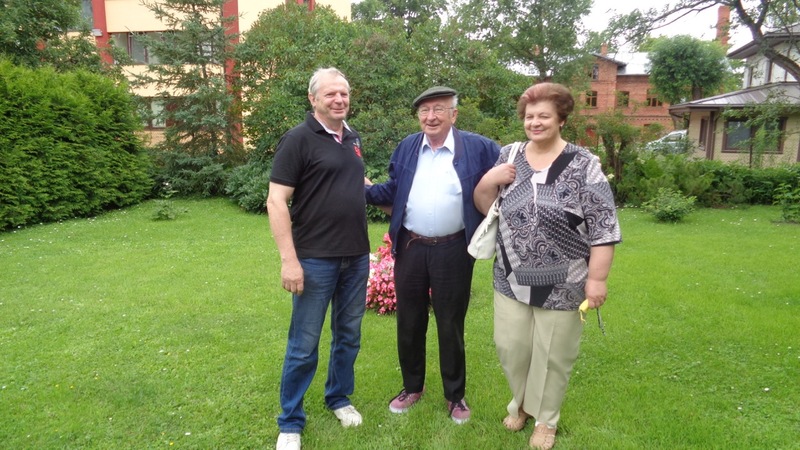 We met Mara whom he introduced as his wife of fifteen years. I didn’t know he had become attached again after his divorce. Janis had visited Lincoln in 1997 with his then wife. Vitauts drove them all around the United States showing them the sites. Janis is a television repairman, and he fixed our Zenith television that Trish (my ex-ex-wife) had bought for her graduation in 1994. It still worked when, I think, Trish finally got rid of it in 2008 or so when she left Ashland. We found out that the table we were sitting at and the little benches by the garage were all hand-crafted by Janis himself. 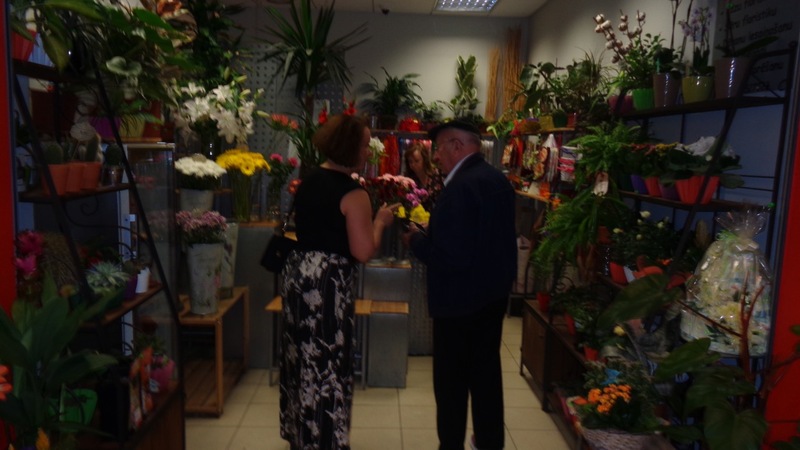 He proudly showed us his shop which was in an adjacent side building. One thing you notice about Latvia is they don’t often have garages, but they always seem to have saunas or some other kind of out-building AND they have beautiful lawns. Again, his house was no exception. We had planned to eat somewhere together, but guess what? 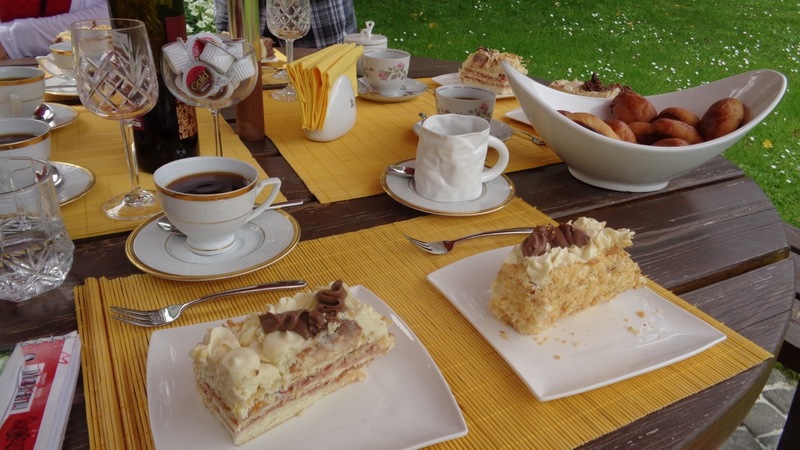 Janis and Mara had prepared a typical Latvian “appetizer” with a bowl full of delicious pirags and a gigantic chocolate torte. They served us slices big enough for three men, and we ate every bit happily. Juris spoke really good English, and Mara took to dad like a paint to a canvas. She had him laughing and was telling him where to go and what to do. It was really nice. 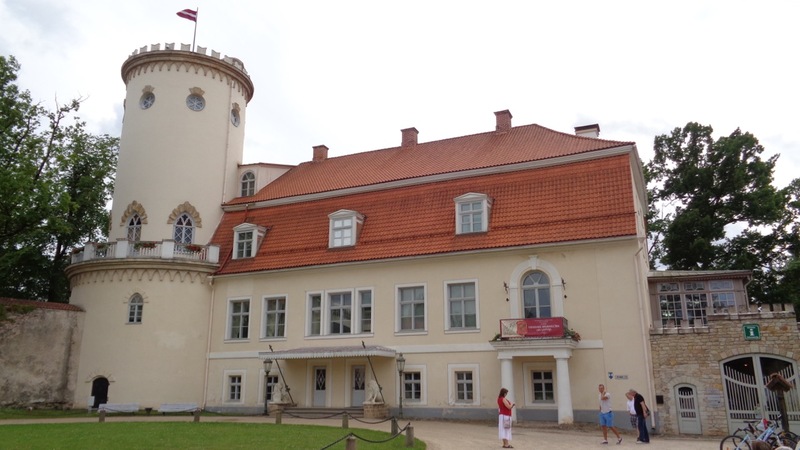 After our little luncheon and photographs, we hopped in the vehicles to explore Cesis pils, the big old castle. This wasn’t like the Jaunmoku pils which was more of a manor house, this was the real deal. Stone walls built to resist armies, and giant towers for launching barrages of arrows at invading enemies. Walls all around created what seemed to be an impenetrable fortress. And yet, most of the castle was just a ruin. 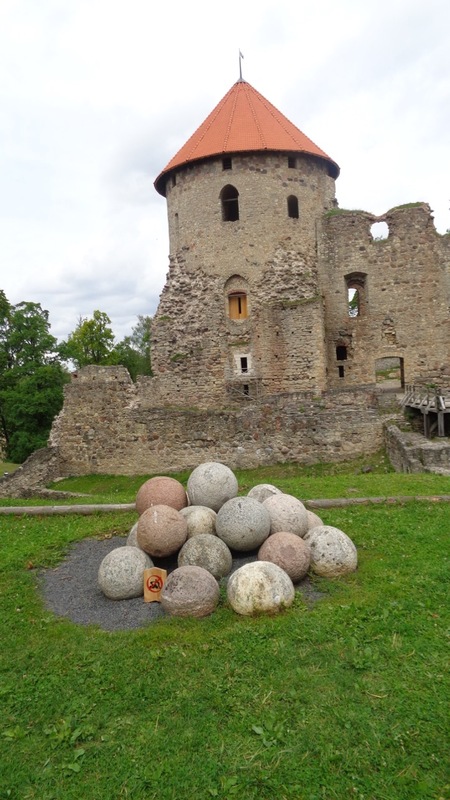 I found out later that Ivan the Terrible had sieged the castle with his giant artillery weapons and was going to take it one way or the other. 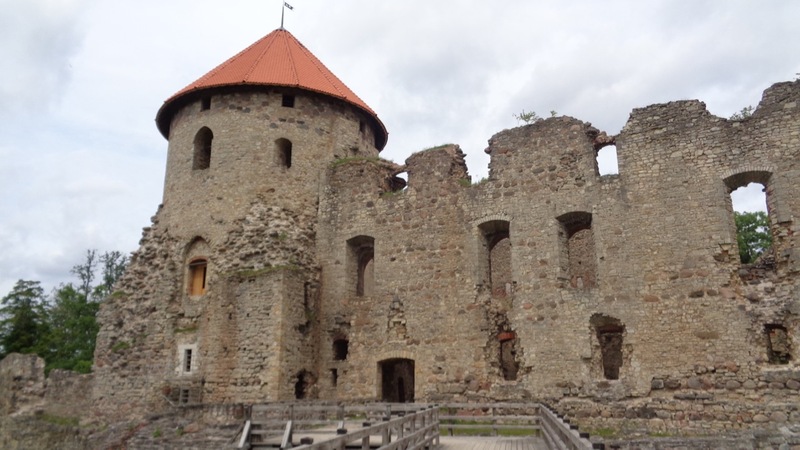 So, in 1577, the people inside the castle including all the local villagers who had gone there for shelter decided to blow it up instead of allowing Ivan to take it. The brave people of Livonia sacrificed everything rather than being prisoners of the Russian intruder. I think that says a lot about Latvia’s national character. The history of the castle is simply incredible. They are still unearthing artifacts. 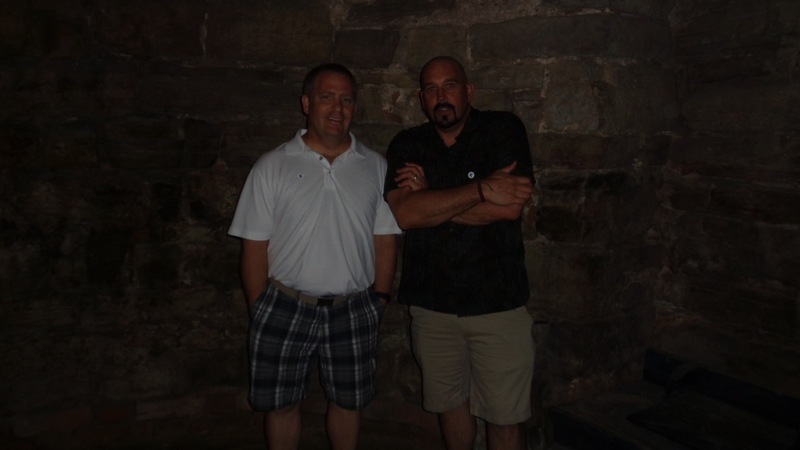 They let you climb down into an actual dungeon… we would never, ever let people do this in America. You get to climb spiral staircases to the top of the restored tower holding a lantern with an actual flame candle in it for light. At first, I thought the lantern was a gimmick but you really do need light, and they really worked well! 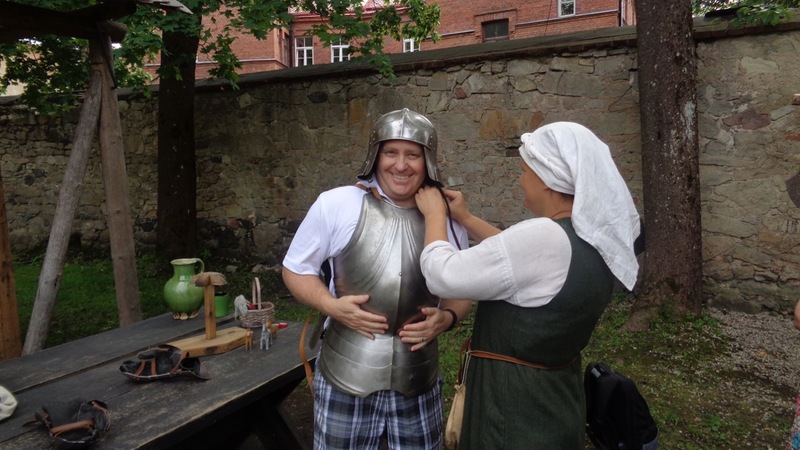 Outside of the castle, they dress up in the old costumes and there is a blacksmith who demonstrates how they made jewelry and weapons back in the 13th century. A gardener has planted the traditional crops of Latvia using only medieval tools. And we even got to try on some armor and see the toys and games of the people of Livonia way back when. My big hope is that someday the United States gets over its fetish to sue people for everything all the time, so we can have fun like this in America without signs and guards and all of that. 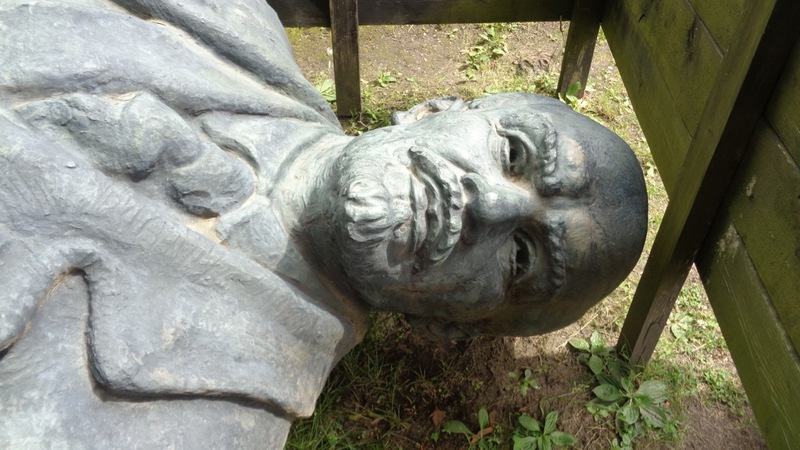 One of the haunting highlights of this adventure was the statue of Lenin that had been taken down and now is stored in a giant wooden box that resembles a coffin. His hollow eyes stare at you when you walk by. Good riddance! And not only does 6 Euro get you into the old castle, but you get to explore the new castle as well which has been turned into a museum. The coolest part for me was climbing another spiral staircase to the top and seeing the library which has this incredible white fireplace that looks like ivory. I could definitely see it being an artifact from a Dungeons and Dragons game. 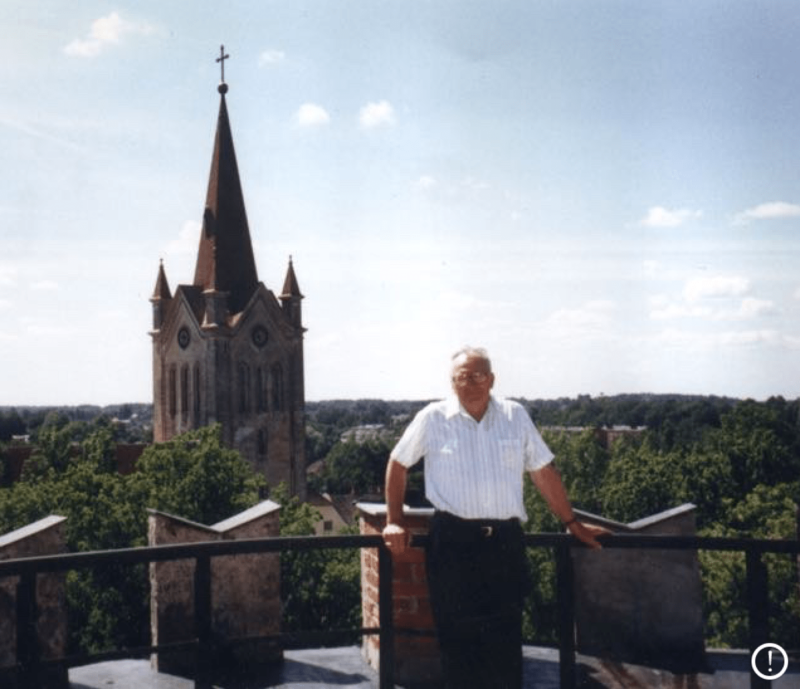 We all went to the roof and I tried to pose in the same place that dad did when he went to Cesis in 1991 or 1997. We couldn’t be sure of the year. 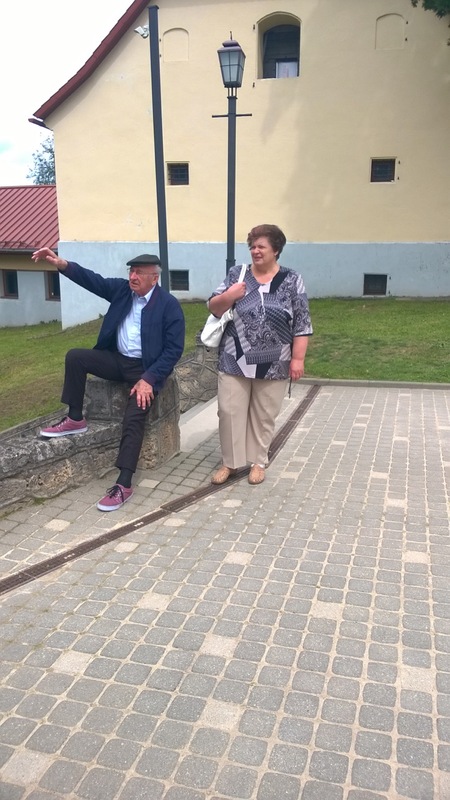 As we toured the castle, dad stayed behind with Mara and Janis joined them to drive him around the city and show him some of the other cool things about Cesis. When we found him, he was laughing and just having a terrific time with her. He was at home, with family. After all of that, we piled in the cars again to take the bumpy country roads to Strautini, dad’s family home just outside of Smiltene some 20 kilometers away. Side Note: When I visited Germany in 2005, we went to a few castles, and they were fun, but this is by far the coolest castle I’ve been to. So much history. I have always loved the Medieval stuff like knights and jousting and all of that, so this was right up my alley. 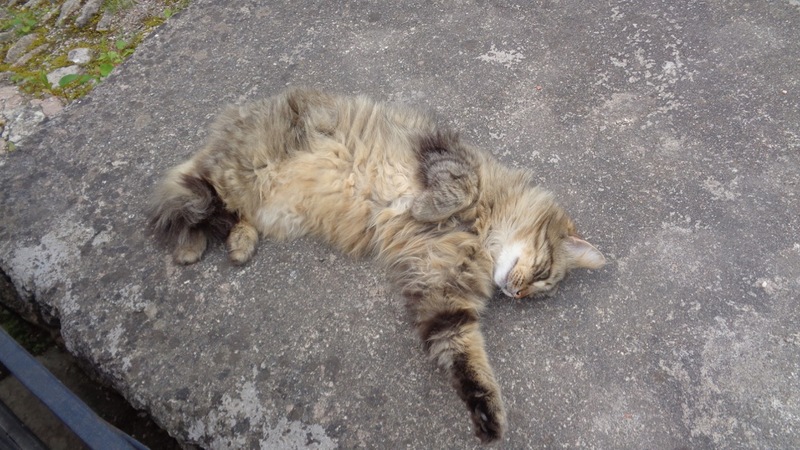 And another side note… Latvia loves cats. They are everywhere! Enjoy the Gallery of Many More Photos… some by Gita!